Photo Collage Maker lets anyone create stunning collages from their favorite photos. Over 100 professionally-designed templates provide an incredible variety of styles and themes to make the collage of your dreams, while a rich choice of tools and effects let creative minds make a collage that is truly their one from scratch. 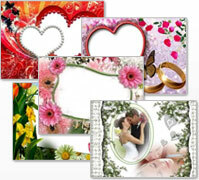 Also the program can be used to make greeting cards, wedding invitations, posters, and desktop wallpapers. There are only three steps to making a collage. 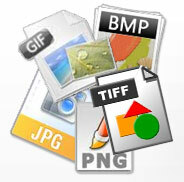 To begin, load photos, arrange them into the layout, and then enhance with frames, masks, clipart and captions. Share the result with your family and friends as a poster or image file! Make Superb Collages in Minutes! Quickly turn your home photos into professional-quality collages. 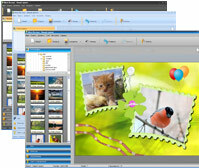 Choose from a wide range of templates, add photos and use frames, clipart and captions to preserve memories with style. Start quickly with an amazing collection of over 100 templates in a range of styles and themes, including Wedding, Kids, New Year, Vintage, Abstract. Also you can make a custom template from scratch. Stay on the creative track by enhancing photos with picture frames and photo edge effects that come in a variety of styles, from classic to modern. Your collage will look twice as attractive! Add text captions and customize their font, color, size to match the collage design. 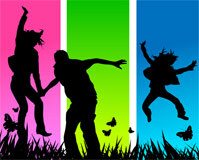 Make use of clipart with professionally-designed pictures to highlight your message or decorate the collage. Prepare your collage for printing in the Print module that lets you produce the results you want. 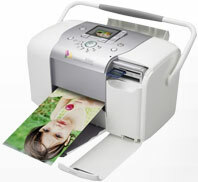 Choose a printer and paper format, set margins, enable print markup and get high-quality output. 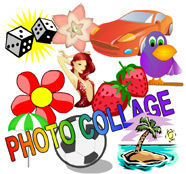 Save collages to popular images formats, including BMP, JPEG, PNG, TIFF, and GIF; perfect for sending to friend or family by email, posting to the Facebook, or your personal blog. Customize JPEG quality and preview the result. 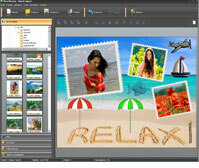 Photo Collage Maker has a skinable interface that can be customized to user preferences. 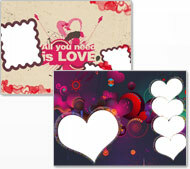 Choose from a range of exciting skins, including Windows 7, MS Office and Mac style, to personalize your working space. Work with a complete set of collage authoring tools and options that give you unprecedented freedom to express your inner creativity. Photo Collage Maker gives you superb results every time.